The sunny fall day brought out hundreds of thousands, according to organizers, though no official estimates were available. 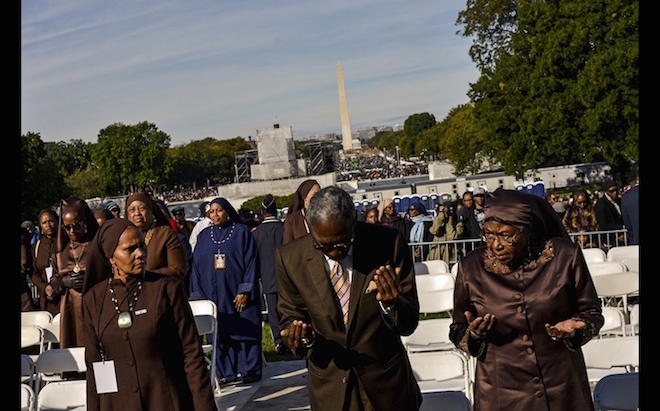 The crowd was predominantly black, ranging from millennials in “Black Lives Matter” T-shirts to Nation of Islam adherents with women in brown headpieces and matching garments. The rally addressed a range of grievances connected to justice including calls to stop deportation and to reduce mass incarceration. Farrakhan, 82, called for 10,000 men to help address crime in the African-American community. “I want 10,000 names that we can train ’cause we got to stand between the guns,” he said, alluding to both black-on-black crime and the killing of unarmed black people by police. He also listed a range of other “instructions,” including doing more to educate children in schools that promote “white supremacy,” and focusing on Jesus instead of Santa this Christmas. Farrakhan praised Pope Francis for visiting the United States, but sided with those Native Americans who criticized his canonization of St. Junipero Serra, a 17th-century Spanish Franciscan who helped establish the mission system in California. Several in the crowd said they appreciated the gathering’s emphasis on a diverse range of calls for justice. Cammy Payne, a nurse from Tulsa, Okla., welcomed the focus on unity across races and religions. Donna Auston, a Ph.D. candidate at Rutgers University who is a researcher and an activist with the “Black Lives Matter movement,” said the event demonstrated a confluence of the Nation of Islam and other activists joining with the newer Black Lives Matter on addressing police brutality, an issue that has long been fought in the black community.